(CNN) -- The swine flu outbreak is spawning debate about how people get information during health emergencies -- especially at a time when news sources are becoming less centralized. Buzz about swine flu on Twitter is stirring conversations about how people get health news. Some observers say Twitter -- a micro-blogging site where users post 140-character messages -- has become a hotbed of unnecessary hype and misinformation about the outbreak, which is thought to have claimed more than 100 lives in Mexico. "This is a good example of why [Twitter is] headed in that wrong direction, because it's just propagating fear amongst people as opposed to seeking actual solutions or key information," said Brennon Slattery, a contributing writer for PC World. "The swine flu thing came really at the crux of a media revolution." Twitter's popularity has exploded in recent months, and Slattery said it's a new development that a wide number of people would turn to the site in search of information during an emergency. A spokesman for the Centers for Disease Control and Prevention, however, said that the online buzz about swine flu is a good sign. It means people are talking about the issue, and that's the first step toward learning how to reasonably protect yourself. "I think it's generally a useful development, but I would encourage people to look to other sources, especially established, recognized medical authorities," said Glen Nowak, chief of media relations at the CDC. "It shows that people are engaged and they care and that it's caught their attention -- and those all are good things." About 36,000 people die from flu-related symptoms each year in the United States, according to the Centers for Disease Control and Prevention. The fast pace of new swine flu cases and their relevance to global public health policy makes the situation newsworthy, Tompkins said. Tompkins said there is a tendency for television stations to hype health emergencies to boost their ratings, but so far coverage of the swine flu outbreak has been responsible. Coverage of the story is just ramping up, though, he said. Of the swine flu news on Twitter, Tompkins said, "Bad news always travels faster than good news. I'm sure that was true in smoke signal days." Unofficial swine flu information on Twitter may lead people to unwise decisions, said Evgeny Morozov, a fellow at the Open Society Institute and a blogger on ForeignPolicy.com. Morozov said there's incentive for Twitter users to post whatever is on their mind because it helps them grow their online audiences. But in an emergency, that tendency means people write about their own fears of symptoms and widespread deaths, which can create an uninformed hysteria, he said. The debate about swine flu on Twitter is not one-sided, however. And the site is not the only place online where people are talking about the outbreak. Some Twitter users have expressed concern that the swine flu story is being hyped. 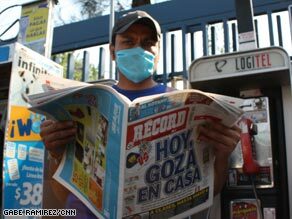 Several media outlets, including the BBC and CNN's iReport.com, give readers and viewers a chance to express their own views about the outbreak. The Centers for Disease Control and Prevention also maintains its own Twitter account where official government information is given straight to the public. And on Monday, President Obama seemed to try to calm national fears by saying the outbreak is "cause for concern and requires a heightened state of alert" but is not a "cause for alarm," CNN reported. Twitter traffic about swine flu has been strong. According to Nielsen Online, swine flu has worked its way into about 2 percent of all notes posted on the site on Monday. You can follow that Twitter conversation here. Chatter about swine flu is also loud elsewhere online. About 10 times more people are writing online about swine flu than wrote about the salmonella and peanut butter scares from this winter, Nielsen says. Slattery, the PC World contributor, also criticized television news stations like CNN and Fox News for hyping the story and adding to public fear. He said he generally was excited about Twitter until recently. Now, it's changing, and he finds the site to be "an incredibly unreliable source of information." Nowak, of the CDC, said the media has done a good job of informing the public about the outbreak. He said some headlines, however, have been a bit sensational. Tompkins said people who post information on social media sites should think about the credibility of their sources before they pass something on. That's the "online equivalent of washing your hands," he said. "Before you pass it on, wash your hands a little."